Have you ever wondered what stuffed animals do while their companion humans are at school? What if a teddy bear invited all his stuffed animal friends over? Imagine the wild party that might ensue, complete with jumping (a little too hard) on the bed, coloring on the walls, dressing up in Mom’s clothes, having a bubble-bath sliding contest in the hall, sledding down a “cushion mountain” on a cookie tray. . . . As adorable as it is raucous, Jancee Dunn’s whimsical tale of freedom and fun comes to vibrant life in Scott Nash’s colorful illustrations. Jancee Dunn has written for Rolling Stone, the New York Times, Vogue, GQ, and O: The Oprah Magazine, as well as many books for adults. 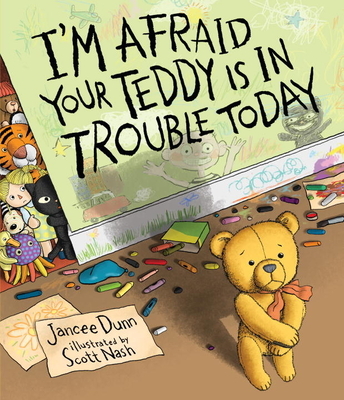 I’m Afraid Your Teddy Is in Trouble Today is her first book for children. She lives with her husband and daughter in Brooklyn, New York. Scott Nash is the creator of the illuminated middle-grade novel The High-Skies Adventures of Blue Jay the Pirate, the early reader Tuff Fluff: The Case of Duckie’s Missing Brain, and Shrunken Treasures, a collection of seriously abridged classics. He is also the illustrator of Saturday Night at the Dinosaur Stomp by Carol Diggory Shields and many other children’s books. He lives on Peaks Island off the coast of Portland, Maine. Nash's digital illustrations capture the zany day in an engaging color palette...Although there are only six humans in the story, Nash uses them to highlight the diversity of Teddy's neighborhood. The mischievous antics of a teddy bear and his stuffed friends draw the attention of the police in this raucous story, the first children’s book from adult author Dunn...With Dunn and Nash as guides, readers will revel in the vicarious, rule-breaking fun. A humorous tale of stuffed animal mayhem that will entertain early elementary students and provide a fun read-aloud for younger children. The deadpan tone of the text makes the pictures all the funnier, and Nash keeps the toys looking like toys even as they play...many kids will love contemplating what their own stuffed animals might get up to if they decided to have a party.